The British Foreign Secretary: MPs are calling on the Prime Minister to sack him, and instead of apologising to keep the peace, he’s provoking further discord by digging his heels in. 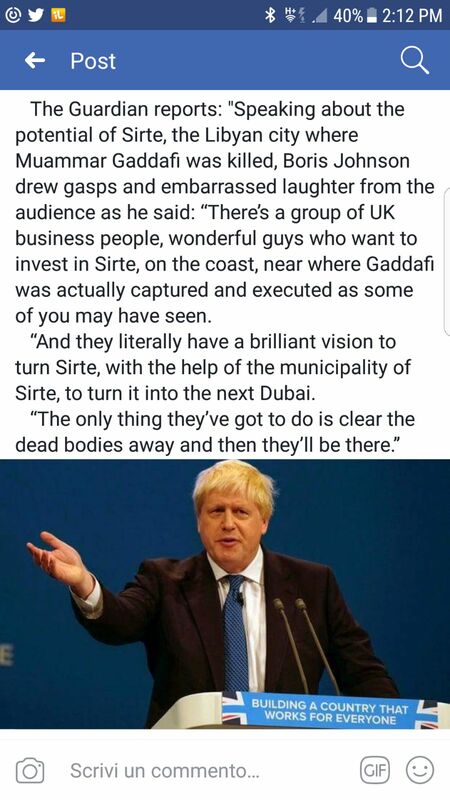 I can understand that kind of cynical remark being made at a dinner party among friends – oh, they want to turn Sirte into a business centre, do they; well, all they have to do is clear the dead bodies away – but you just don’t make it in public when you’re Foreign Secretary. We certainly do live in interesting times. I get the uncomfortable feeling that the 25-year-odd hiatus of relative peace and quiet that Europe enjoyed following the fall of the Iron Curtain and the end of the European terrorist groups may be turning into something quite unpleasant.